This was mentioned in a build,log amd I thought it wouldbbe an interesting post. What are your horror stories? What went wrong? Did you recover? What did you learn? This is one of mine. I was trying a new rigging method with upwards of thirty lines running out of the bottle. It wasn't well organized and the entanglement made it impossible to get the ship up. 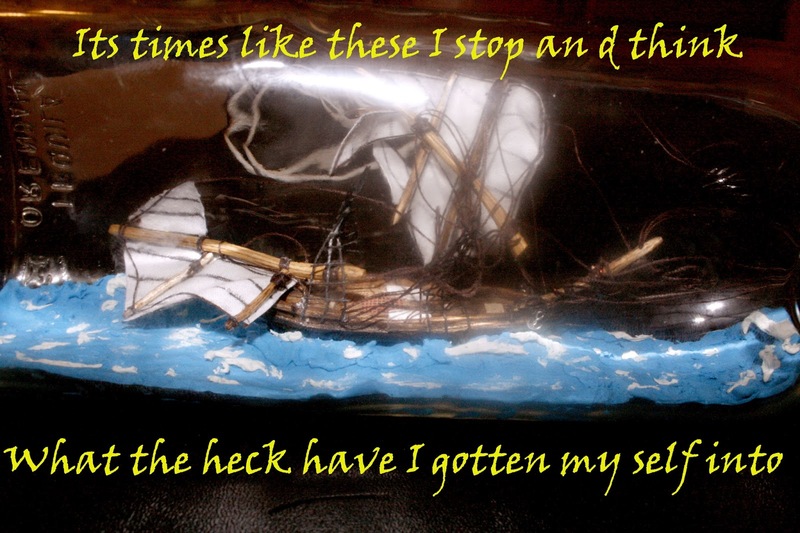 I yanked the ship out which further tore it up. It sat on a shelf and eventually went in the trash. I've yet to revisit that method. You yanked the whole ship out? All I did was two lines! Newcomers to the SIB hobby reading these posts... please don't be discouraged in any way to putting a ship in a bottle. Many SIB'ers have been doing this for twenty years and in twenty more, they'll have it down pat. I thought I could concentrate enough to put tools in and bring them out of a bottle without snagging anything. Trimmed up a pair of lines super-close to a tie down point that had a touch of adhesive added. Good enough. I commanded myself to not touch those lines until applying the securing adhesive in the next step. Surely I could do that. I could only picture the effort needed to place them back if they were disturbed. Sure enough, snagged the yard, out they came. What have I learned? For me, re-training in disciple is necessary. It doesn't work by rushing the tool to the work point and after that, your done. The tool must be guided in, used, and guided out. Every single time. Did I recover? Couple more sessions and I should advance to the next stage. This should be an interesting thread. As I'm quite new to this, so far it's been a steep learning curve. So far, on a previous build I managed to snap a yard in half, then I managed to flip the front mast and ended up with the rigging lines through the bowsprit criss crossed! And had to painfully un thread them in the bottle and then re thread them with a cut down needle in a pair of tweezers as I'd already glued the mast in place! ? This time on my current build I've just managed to glue the rear mast in place and then snap it off 10 minutes later because I'd drilled a hole but didn't end up using it, and forgot to make good the hole! Luckily the rolled up spanker is now not just for show but now glued to the mast as reinforcing! ? I learn from my mistakes, it's just a shame that each mistake is not the same as the last! They just get bigger and better! Nice save. Not making the same mistake twice isn't a bad thing. I think get more frustrated when I make the same mistake. I should know better after the first two times. ?